​​​We have been saying it for years. I have even done a presentation on the environmental sustainability of restoring wooden windows over buying new. Restore your old windows instead of buying cheap, unsustainable, plastic ones!! Here is some proof. Hire us to help you maintain the historic and envoronmental integrity of your houses!!! My company is Karnage Creations LLC and you can find us online at Richmond Window Repair Call or text or email us today to get started on your window restoration process. We have been saying it for years. Restore your old windows instead of buying cheap, unsustainable, plastic ones!! Here is some proof. Hire us to help you maintain the historic and envoronmental integrity of your houses!!! “We use Angie’s List to assess whether we’re doing a good job keeping valued customers like you happy. Please visit AngiesList.com/Review/8828339 in order to grade our quality of work and customer service. You may have heard recent news stories in the Richmond area about folks posing as contractors, doing crappy jobs, and ultimately stealing from their clients, who are often left with a worse mess than they started with. You can greatly lessen your odds of ending up in such an unfortunate situation by doing a little research on your contractor. You want someone who has taken the time, investment, and has the knowledge and skills to become licensed. The Virginia Department of Occupational Regulation is the department in charge of, well, regulating contractors. Depending on the type of work you need done and the size of the job you will need a different type of contractor. Whenever you are seeking bids for work, check your contractor online. It takes just a few minutes and can end up saving you thousands. Type in the name of the company, owner, etc. to check the status of their license. Find us by searching for Karnage Creations. Also, insurance can be an issue. We tell you we are licensed and insured, but you don’t have to take our word for it- look us up, and ask for a certificate of insurance. These are just some of the most basic things that make a difference in the level of professionalism you can expect from Karnage Creations LLC. We are here to work with you to help you solve your window problems. And if you don’t choose us, we urge you to choose a qualified, licensed, and insured contractor. We restore/repair/renovate historic windows, you choose which ever one of those words you prefer. We do free bids, so if you have a problem, we can come take a look, and give you a bid covering your options and associated costs to repair. We understand that sometimes things just need to be repaired in the short term fastest, cheapest way, and sometimes we are lucky enough to have the time and money to do things the right way. Communicate with us about your needs and thoughts and we will communicate back to try to clear up the process for you! Rot- for wood that is rotten, but not in need of total replacement, we rely on the Wood Epox system to give a quality repair that will last for years. Compare to wood putty, bondo, or other insufficient means of repair employed by others. Paint – We can paint, or strip paint as needed based on your windows. We also encounter windows that are painted or caulked shut, and can make them operable for you again. Glass – We replace glass with 1/8 double strength glass in many cases. We can also source old (wavy) glass, tempered glass, etc. depending on the requirements of the job and your desires. If you have wooden windows that you want fixed, whether you are a home owner, landlord, or contractor, please get in touch to see if we can work together to keep Virginia beautiful! (804) 385-2827 call or text, or better yet, email karnagecreationsllc@gmail.com so we can schedule a consultation! Licensed and Insured contractor, available in the Commonwealth of Virginia for your window repair and restoration needs! Will fix windows in warmer places!! Moriah (Mo) Karn is the owner of Karnage Creations LLC, and had been using Karnage as their pen name. We decided that Karnage Creations describes what we do fairly well. 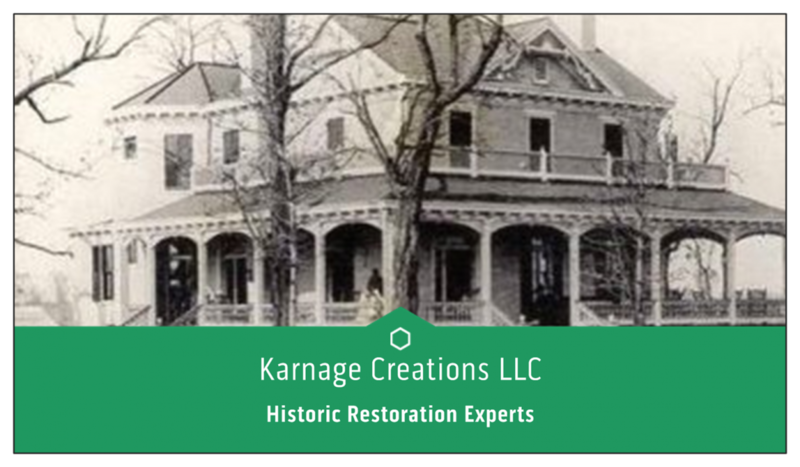 Out of Karnage we Create stylish, functional, historical windows for our clients. Sometimes you have to deal with some broken glass to end up with art. 7am to 7pm, 7 days a week!